Self-made success, Macklemore brings the depth back to Hip Hop with his socially conscious lyrics and ill beats. His music takes me back to the 90s when rap wasn't just all about money and hoes but actually tackled relevant issues like racism and abuse. I have much respect for this man and it is with great pleasure that I present this giveaway for you all in cooperation with SM Accessories! 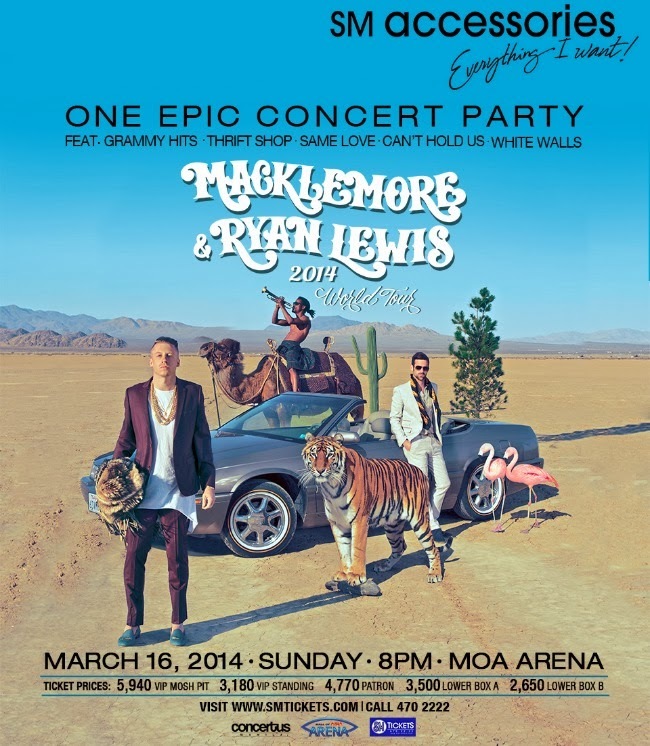 Get the chance to see Macklemore and Ryan Lewis in concert for free this March 16, 2015 at the MOA Arena!!! Fashion Eggplant in cooperation with SM Accessories is giving away a pair of Lower Box tickets worth P2650 each to one lucky reader. To join, just fill up the Rafflecopter form below. Share for more chances of winning!! !